Thomas B. Allen’s expertise in military history and strategy is combined with Roger MacBride Allen’s knowledge of technology to reveal a lesser-known yet fascinating side of the 16th president of the United States. Their authoritative narrative reveals Lincoln as our nation’s first hands-on Commander-in-Chief, whose appreciation for the power of technology plays a critical role in the North’s Civil War victory over the less developed South. Readers meet Lincoln as he exchanges vital telegraph messages with his generals in the field; we witness his inspection of new ship models at the Navy Yard; we view the president target-shooting with the designer of a new kind of rifle; and we follow Lincoln, the man of action, as he leads a daring raid to recapture Norfolk, VA. The book’s historic sweep also sets Abraham Lincoln in the context of his military era: we learn about the North’s Anaconda Plan, the South’s counter strategies, and how the concept of total war replaced the old Napoleonic way of fighting. Readers will come away with a rich sense of a leader who lived through one of the most exciting ages of technological and social change in America. 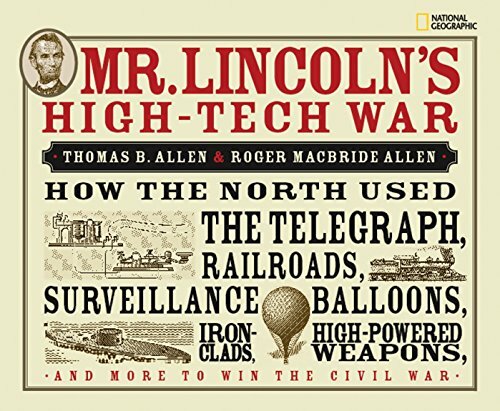 With archival photographs, artwork, and maps, Mr. Lincoln’s High-Tech War brings alive a time when the railroad brought soldiers and to and from the battlefields, when hot-air balloons were used for surveillance, and when ironclad warships revolutionized naval warfare. The Allens’ detailed study demonstrates why Lincoln’s appreciation of the importance of technology, his understanding of the art of war, and his mastery of military strategy were key elements in the winning of the American Civil War.